octor Elisha Dix of Orange Court, Boston, was never happier than when his pet grandchild, little Dorothea Dix, came to visit his wife and himself. Every morning he had to drive about the city, in his old-fashioned chaise, to see how the sick people were getting along, and he did love to have Dorothea sitting beside him, her tongue going, as he used to declare "like a trip-hammer." She was a wide-awake, quick-motioned creature and said such droll things that the doctor used to shout with laughter, until the dappled gray horse which he drove sometimes stopped short and looked round at the two in the chaise as if to say: "Whatever in the world does all this mean?" But when the time drew near for Dorothea to go back home, she always looked sober enough. One day she burst out: "Oh, Grandpa, I almost hate tracts!" Doctor Dix glanced down at her in his kind way and answered: "I don't know as I blame you, Child!" You see, Joseph Dix, Dorothea's father, was a strange man. He had fine chances to make money because the doctor had bought one big lot of land after another and had to hire agents to look after these farms and forests. Naturally he sent his own son to the pleasantest places, but the only thing Joseph Dix, who was very religious in the gloomiest sort of a way, really wanted to do, was to repeat hymns and write tracts. To publish these dismal booklets, he used nearly all the money he earned, so that the family had small rations of food, cheap clothing, and no holidays. Besides having to live in such sorry fashion, the whole household were forced to stitch and paste these tracts together. Year after year Mrs. Dix, Dorothea, and her two brothers sat in the house, doing this tiresome work. No matter whether, as agent, Mr. Dix was sent to Maine, New Hampshire, Vermont, or Massachusetts; no matter whether their playmates in the neighborhood were berrying, skating, or picnicking; no matter how the birds sang, the brooks sparkled, the nuts and fruit ripened; the wife and children of Joseph Dix had no outdoor pleasures, no, they just bent over those old tracts, pasting and sewing till they fairly ached. When Dorothea was twelve, she decided to stand such a life no longer. Fortunately the family was then living in Worcester, near Boston, and it did not cost much to get there. Doctor Dix was dead, but Dorothea ran away to her grandmother, who still lived at Orange Court (now it is called Dix Place), and although Madam Dix was very strict, life was better there than with the tract-maker. At Orange Court, Dorothea was allowed no time to play. She was taught to sew and cook and knit and was sometimes punished if the tasks were not well done. "Poor thing," she said in after life, "I never had any childhood!" But she went to school and was so quick at her lessons that in two years she went back to Worcester and opened a school for little children. She was only fourteen and rather small for her age, so she put on long dresses and piled her hair on top of her head with a high comb. I think people never guessed how young she was. Anyway, she proved a good teacher, and the children loved her and never disobeyed her. After keeping this school for a year, she studied again in Boston until she was nineteen. Then she not only taught a day and boarding-school in that city, but looked after her brothers and opened another school for poor children whose parents could not afford to pay for their lessons. She took care of her grandmother's house, too. While every one was wondering how one young girl could do so much, she made them open their eyes still wider by writing three or four books. By and by her health broke down, and she began to think that she could never work any more, but after a long rest in England she came back to America and did something far greater than teaching or writing--she went through the whole country making prisons, jails, and asylums more comfortable. Up to the time of Dorothea Dix's interest, no one had seemed to bother his head about prisoners and insane people. Any kind of a place that had a lock and key was good enough for such to sleep in. And what did it matter if a wicked man or a crazy man was cold or hungry? 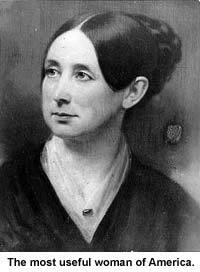 But it mattered very much to Dorothea Dix that human beings were being ill-treated, and she meant to start a reform. She talked with senators, governors, and presidents. She visited the places in each State where prisoners, the poor, and the crazy were shut up. She talked kindly to these shut-ins, and she talked wrathfully to the men who ill-treated them. She made speeches before legislatures; she wrote articles for the papers, and begged money from millionaires to build healthy almshouses and asylums. This was seventy years ago, when traveling was slow and dangerous in the west and south. She had so many delays on account of stage-coaches breaking down on rough or muddy roads that finally she made a practice of carrying with her an outfit of hammer, wrench, nails, screws, a coil of stout rope, and straps of strong leather. Some of the western rivers had to be forded, and many times she nearly lost her life. Once, when riding in a stage-coach in Michigan, a robber sprang out of a dark place in the forest through which they were passing and demanded her purse. She did not scream or faint. She asked him if he was not ashamed to molest a woman who was going through the country to help prisoners. She told him if he was really poor, she would give him some money. And what do you think? Before she finished speaking, the robber recognized her voice. He had heard her talk to the prisoners when he was a convict in a Philadelphia prison! He begged her to go on her way in peace. For twelve years Miss Dix went through the United States in the interests of the deaf and dumb, the blind, and the insane. Then she went to Europe to rest. But she found the same suffering there as here. In no time she was busy again. She tried to get audience with the Pope in Rome to beg him to stop some prison cruelties but was always put off. Any one else would have given up, but Dorothea Dix always carried her point. One day she met the Pope's carriage in the street. She stopped it, and as she knew no Italian, began talking fast to him in Latin. She was so earnest and sensible that he gave her everything she asked for. It was not long after her return to America before the Civil War broke out. She went straight to Washington and offered to nurse the soldiers without pay. As she was appointed superintendent, she had all the nurses under her rule. She hired houses to keep supplies in, she bought an ambulance, she gave her time, strength, and fortune to her country. In the whole four years of the Civil War, Dorothea Dix never took a holiday. She was so interested in her work that often she forgot to eat her meals until reminded of them. After this war was over, the Secretary of War, Honorable Edwin M. Stanton, asked her how the nation could show its gratitude to her for the grand work she had done. She told him she would like a flag. Two very beautiful ones were given her, made with special printed tributes on them. In her will Miss Dix left these flags to Harvard College. They hang over the doors of Memorial Hall. Nobody ever felt sorry that Dorothea ran away from those tiresome tracts. For probably all the tracts ever written by Joseph Dix never did as much good as a single day's work of his daughter, among the wounded soldiers. And as for her reforms--they will go on forever. She has been called the most useful woman of America. That is a great name to earn.